Courtney Force enters the NHRA Dodge Nationals, the first of six playoff races, with the Mello Yello Funny Car points lead, a lead that she’s had since winning the NHRA Southern Nationals at Atlanta in May. 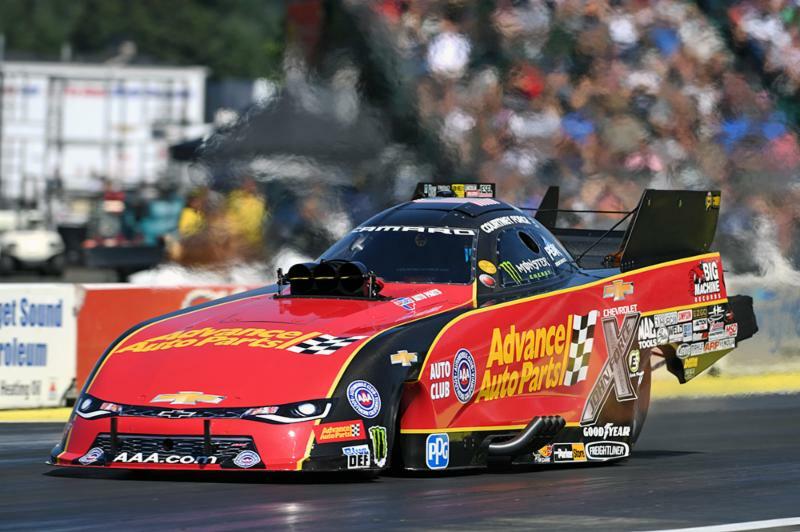 Winning the regular season is an accomplishment the young Funny Car phenom does not take for granted and she’s hoping she and her Advance Auto Parts team can turn it into their first World Championship come the Auto Club Finals in November. Force’s points lead in the Countdown was so fierce, she merely had to make one qualifying pass during the U.S. Nationals to lock-in the No. 1 spot. With four wins, two runner-up finishes and 10 No. 1 qualifiers, Force was unstoppable behind the wheel of her Advance Auto Parts Chevrolet Camaro Funny Car that seems to have the perfect combination with co-crew chiefs Dan Hood and Brian Corradi leading the team. The winningest woman in the history of the Funny Car class with 12 tour victories and 27 No. 1 starts, Force is trying to become the first woman to win the NHRA Funny Car championship. She was third in the final standings a year ago and fourth in 2014. This season, Maple Grove Raceway is kicking off the Countdown to the Championship for the first time. Normally a track suitable for record setting times, the different time of year could make things interesting for all the professional categories. Force has had recent success at the facility, defeating a slew of championship caliber teams before making it to the finals last year. She was the No. 2 qualifier at the event in 2013 and made it to the second round but several first round exits have plagued the Advance Auto Parts team. “This is a track I’ve struggled at but came close to turning things around last year with our finals appearance. I know there’s a lot of potential here with the great conditions and record setting times that are usually here. However, being that we are coming to this track earlier than usual in the Countdown could definitely change the conditions we are used to,” said Force. “I feel that Corradi has had better experience on this track in the past and could definitely bring some of that insight to our car this weekend. We are hoping he is the missing piece that can get this car turned around on such a great track. Before heading to Reading, Force, along with teammate Robert Hight, stopped in New York City to help promote the Countdown to the Championship. Their trip was plagued by the ensuing hurricane and the media’s need to keep the public informed about its severity but the pair were on FOX News, met with John Wall Street and had a meeting with the executive producer of Rachel Ray. Qualifying at the Dodge NHRA Nationals takes place Friday and Saturday with session at 2 p.m. and 5 p.m. on each day. Sunday eliminations are set to begin at 11 a.m.